This easy recipe for saffron rice hails from the south of Thailand, where it is often eaten with roast chicken. 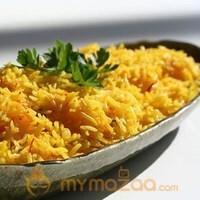 Saffron rice makes dinner extra special, and is nearly as easy to make as regular rice. You needn't own a rice cooker to make this recipe - it's boiled in a pot on the stove, but tastes very similar to steamed rice. 1 Steep the Saffron in 1/2 cup Boiling Water. 2 In a skillet that can be tightly covered, melt the Butter over medium-high heat. 3 Stir in the Rice and Salt. 5 absorb the Butter and becomes opaque, but do not brown the Rice. 6 Quickly pour in the remaining 1 1/2 cups Boiling Water along with the Saffron Water. 7 Cover immediately, reduce heat to low, and cook 20 minutes, or unTil all of the liquid is absorbed. 8 For best results, do not remove the lid while the Rice is cooking.